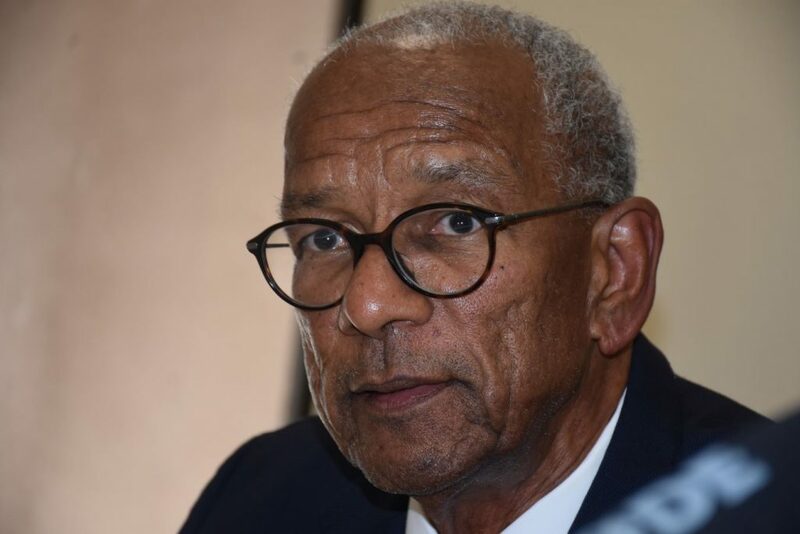 Premier Dr D Orlando Smith says he is banking on legal support to block the UK’s policy that is forcing the BVI to implement public registers of beneficial ownership by December 2020. Though the policy officially became law yesterday (May 23), the Premier still maintains that the BVI will not comply unless public registers become a global standard. The BVI, therefore, has less than two years to prove that the UK has no constitutional authority to dictate any of the territory’s financial services policies. “If all else fails and we are not able to demonstrate that we have the constitutional rights to manage these affairs … then they (the UK) would have imposed an Order in Council,” said Premier Smith during a joint press conference with him and Opposition Leader Andrew Fahie on Wednesday, May 23. Effectively, an Order in Council is a forceful command made in the name of Her Majesty the Queen. Failure to comply with that command can result in the UK exerting diplomatic pressure on the BVI. While backing the Premier’s position of non-compliance, Opposition Leader Fahie added that the BVI has contingency plans. Fahie said, between now and 2020, the BVI will be employing fresh initiatives to keep the BVI economy afloat. “There are aspects of the financial services that can be built upon to ‘drill new wells’ and get new water from. So I don’t want to have it seem as if this is the ‘end all’ and the ‘be all’. 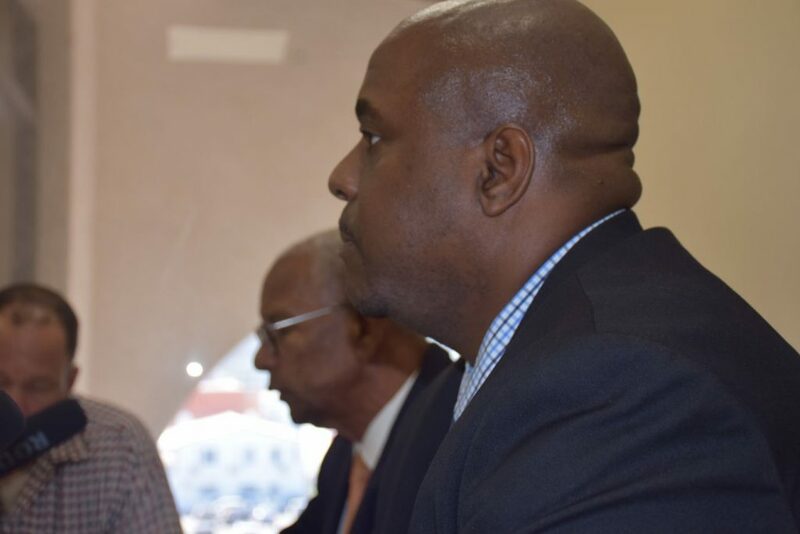 There are much more wells to drill and get water from than just waiting [to see] if this [Order in Council] is imposed on not imposed,” Fahie said. Opposition Leader Andrew Fahie (foreground) beside Premier Dr D Orlando Smith at a joint press conference on May 23. In what resembled a tag team effort between the government leader and the Leader of Opposition, Premier Smith chimed in to give further detail on the BVI’s plan for the threatened financial services sector, which accounts for 60 percent of the territory’s annual revenue. Dr Smith said if the BVI is eventually made to implement public registers, the territory might only “lose a certain percentage” of the sector. But, he assured that local financial services will never fully disappear. The Premier then announced plans to expand other areas of the sector. “We are going there to carry the message that we are still in business, financial services will remain a strong part of the economy of the BVI, and we want to continue to work with you and we want you to continue to work with us,” Dr Smith said. He said the BVI is also actively developing other local industries such as agriculture. BVI will also be creating what Dr Smith described as economic zones to “encourage new kinds of industries to come into the country”. What are public registers, what do they mean? Imposing public registers is an amendment to the UK’s Sanctions and Anti-Money Laundering Act. These registers mean the BVI and other Overseas Territories are required to publicise the names of beneficial owners of offshore companies registered in those jurisdictions. Effectively, beneficial owners are persons who enjoy the benefits of ownership in a company even though the title of the company is in another person’s name. The U.K. public register is a joke. You think? Take this most seriously. This is a major national security/foreign policy issue for the UK. The UK has total jurisdiction over that. Except if you were in charge of your own foreign affairs or independant. This is cold war geopolitics at its best. The BVI regrettably is collateral damage. Be careful. These are the big boys. Stay in your league. Absolute non sense! A demonstration of an uninformed and dull mind. Our governing representatives know quite well the effects such will have on us Afro BVI people now and perhaps centuries in the future. I am sorry that fundamental constitutional issues and the country’s economic future is an issue that bores you. I suggest you go back to watching reality TV or whatever it is you do to find meaning in your life instead. If you had a background or simple understanding of BVI Financial Services you won’t be making such foolish statements. Privacy does not = secrecy or criminal so that is just pure foolishness. The BVI’s AML and Compliance Regime is one of the most rigorous globally and FATF, OECD and other agencies have attested to this. All agents are required to obtain full due diligence information on clients already so why should we have to make it public? We have the FSC, FIA, TA all channels available for authorities if they need information. Would you like the banks to publish your account information for the entire world to see just ‘in case’ other people at your bank might be money laundering? By having the right to privacy that makes you a criminal? Does that make sense to you? @@bored Please provide us with examples of why hiding beneficial owners names is a good idea? Isn’t it mostly about tax avoidance? If the rest of the world is demanding compliance why are we hesitatating? Let’s move on. Orlando assures us (above) that he has a new money making machine. What is it? Respecting people’s right to privacy is NOT hiding anything! The bank will not publish the accounts that they hold for people, are they hiding something or are they respecting your basic right to privacy? Do some research and understand what’s going on here before commenting foolishly. The world is NOT demanding compliance, they are demanding that the BVI be put at a disadvantage to other jurisdictions. The BVI never said they won’t do the public registers, we said we will do it when it’s GLOBALLY REQUIRED, meaning ALL jurisdictions doing it. Why would we put ourselves at a disadvantage willingly? Again, people wanting to keep their business dealings PRIVATE is NOT a crime!!!! This is as close to layman’s terms as I have seen it. This needs to be front page so the people can consume it. The Muppet’s Show continue on! Sanctions next. Its actually even more boring hearing the same pathetic arguments from the armchair financial experts we suddenly have! stop whinging on about it – if we’ve got nothing to hide….anti money laundering initiatives are important whether you agree with it or not and as we don’t actually have a choice – just accept it and cease complaining about it – please…. I thought people say that this man is always sleeping, but his eyes are wiiiiddddeeee open.???????????????? CHINA??? Worst news yet. CHINA?? Oh, and we thought Irma made us suffer? If we can’t get the infrastructure and the service industry and amenities right and get people in here smoothly without all the pointless days spent in labour and immigration, we will keep going backwards. All of our competitors wising up to this.